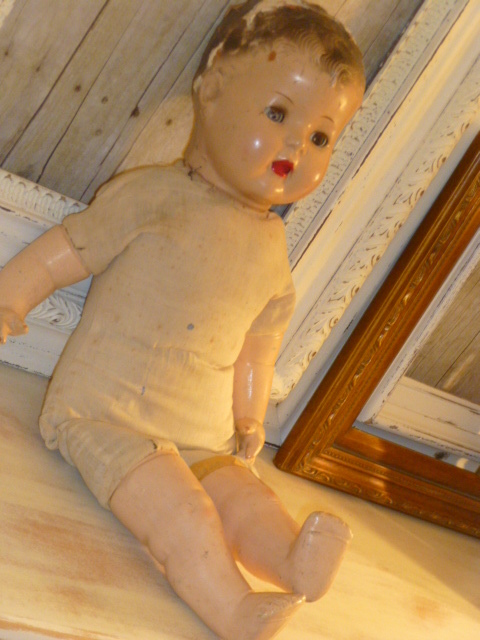 Big vintage baby doll is one of my latest thrifting finds. 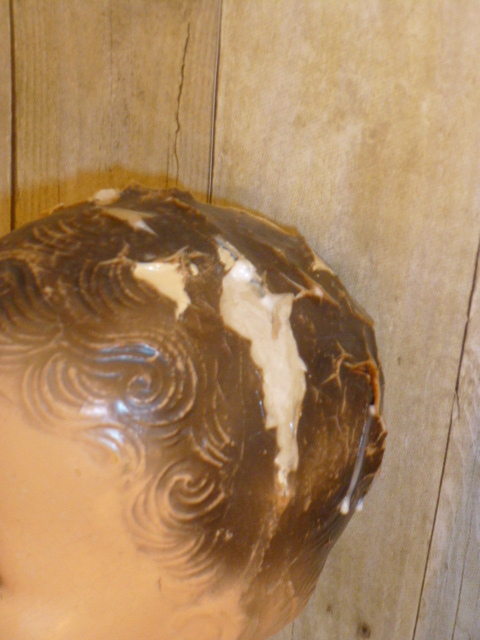 Her hair was cracking and peeling off, so I glued some of it back in place. (see the glue drips!?) I can actually remember having dolls with these kinds of ‘curls’ when I was little. One of her legs is ‘taped’ on. Her fabric body is very badly stained. But there is still something kind of endearing about her, to me at least! I love the shape of her mouth. I think I am going to have to KEEP her . . . for a while at least. Now I don’t normally ‘brave the toy aisle’ at Goodwill. Too many kids playing unsupervised, toys all over the floor, making it impossible to push your cart through . . . .and I’m just not that ‘into’ vintage toys. The few times I HAVE looked at the toys, nearly all of them were ‘newer’ ones anyhow. 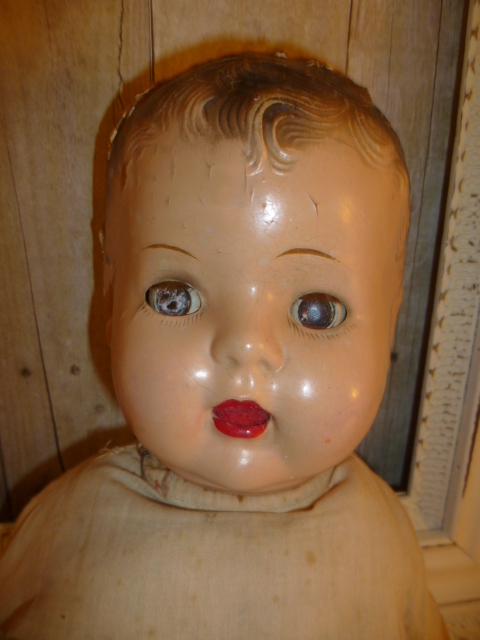 But THEN, at the store closest to Stars (which I have begun frequenting after I work on my booth) while in the check out line a few weeks ago I saw another lady with several ‘cool vintage dolls’ (like this one I just found) in her cart! So of COURSE, now that I SAW what I was missing, I’m making it a point to peruse the toy aisle; at least at this particular store. 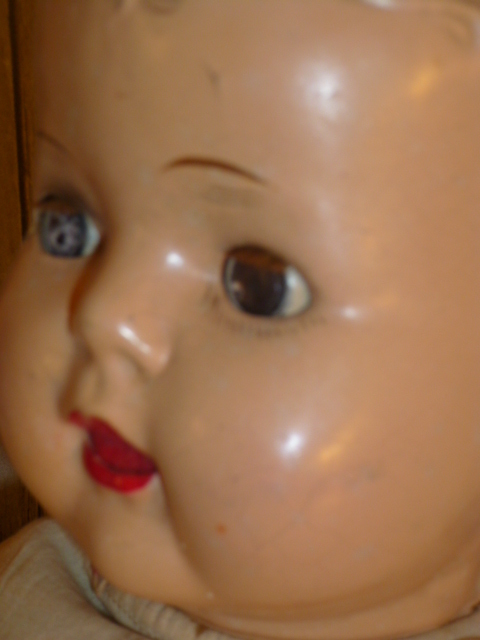 There was one other similar doll that I grabbed . . and quickly put back! It was one of those with a regular doll head, and a stuffed animal body!! ACK! WHO invented those things and WHY! They are just CREEPY! Most of them anyhow, and definitely that one was creepy. 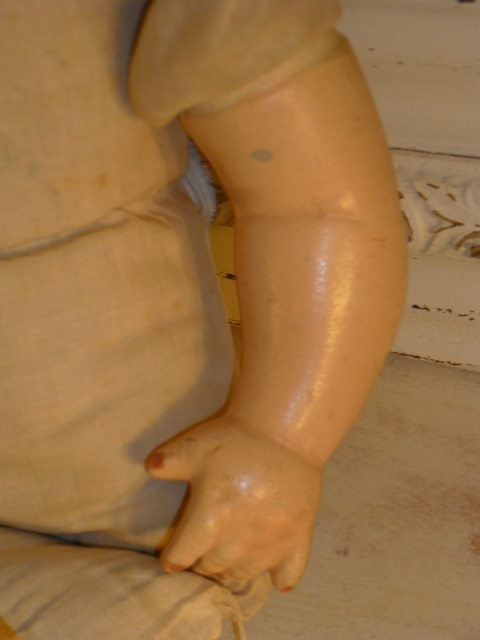 A fleshy tan color reclining body with a baby doll head. Totally creeped me out! 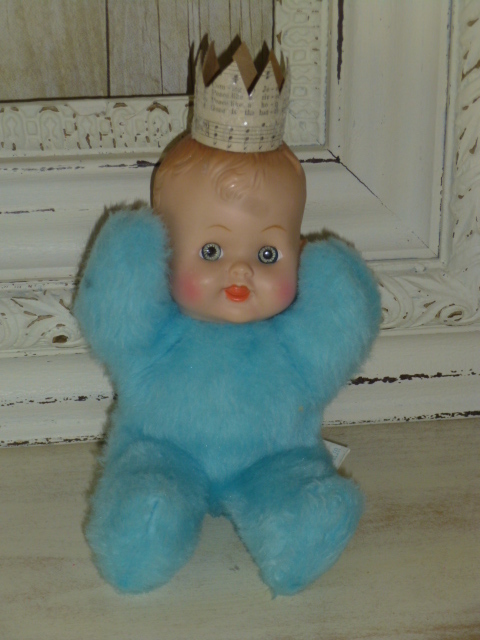 For a split second I considered buying it ‘for the head only’ but the thought of decapitating it and disposing for the body made me a little nauseous. So I left it for someone else. Then I remembered, I actually HAVE one of those ‘fur body’ dolls!?!?! But mine is very cute. And her fur body is turquoise. I gave her a crown and considered adding some little buttons down her front to make the fur look more like fuzzy jammies. But I usually put her ‘at the back’ of a group of dolls so that all that really shows is her head. 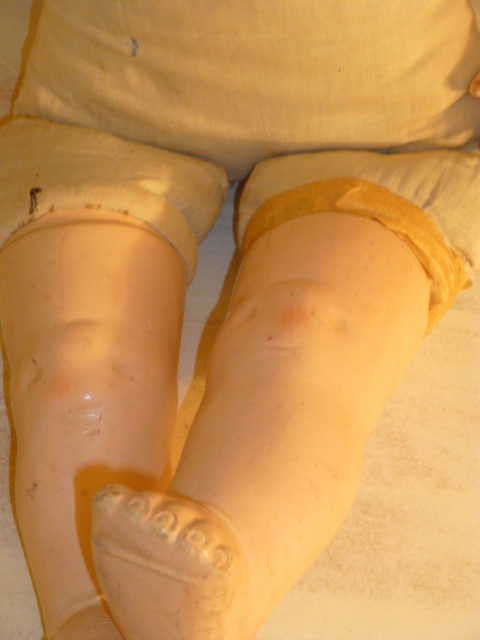 So then I go to wondering about the history of these dolls with fur/animal bodies??? Were they originally manufactured like that? Or was this something where people took 2 broken toys and put them together to make one whole toy?? I wish I had taken a picture of the one at GW to show you. 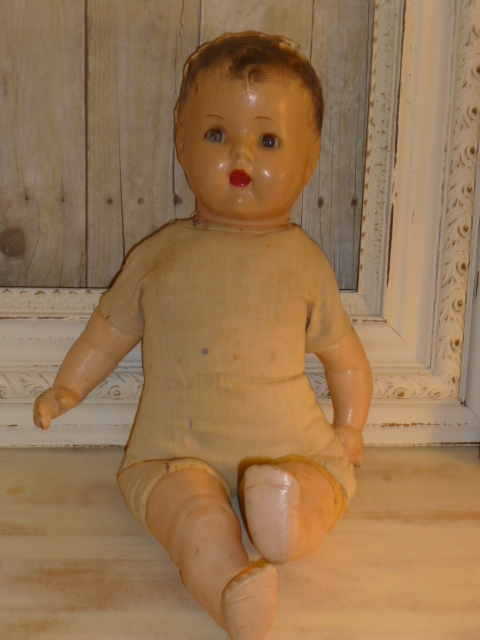 Do any of you know anything about the history of this style of doll? I’m just curious. 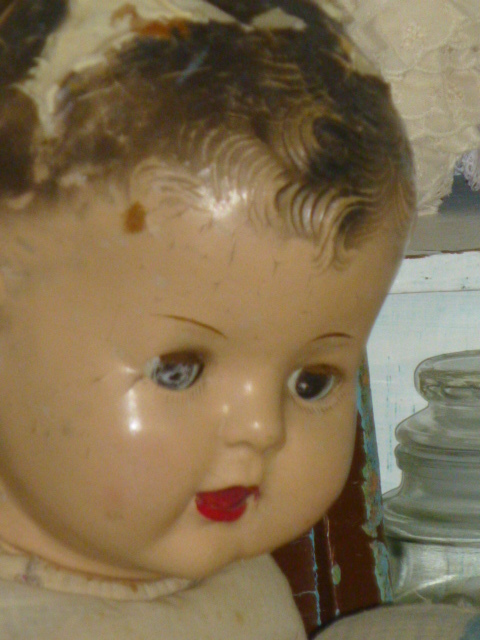 Back to the baby doll for a moment. Even with her wonky eyes, she is quite photogenic! Now I just have to figure out what to NAME her! Love her! 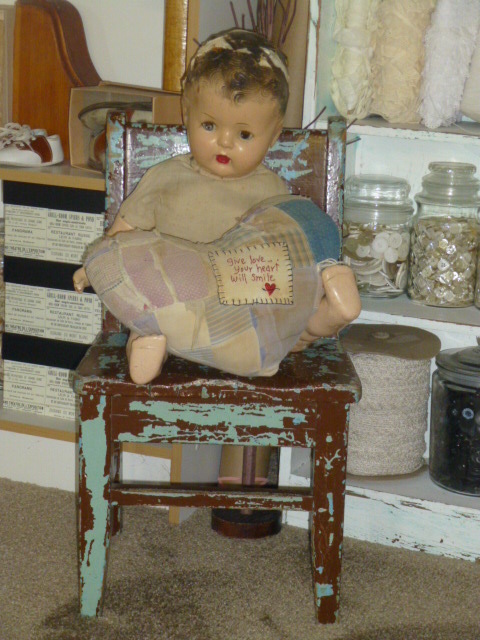 When my husband and explore thrift stores and antique shops, I have a tendency to talk to the dolls. It creeps him out a little. 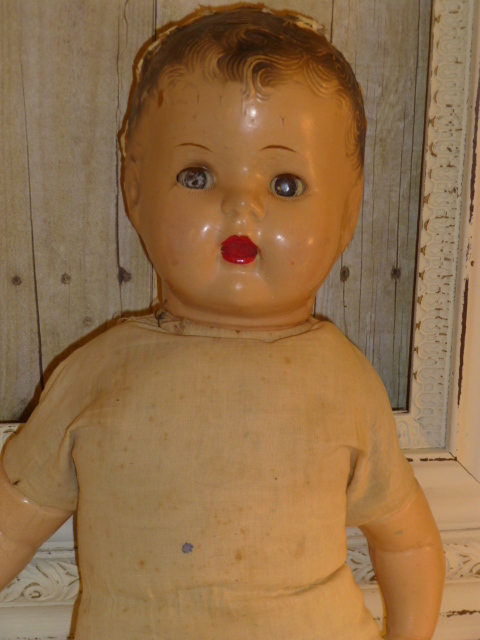 The only old (relatively speaking) doll that I have is a “Chrissy” that I got for Christmas when I was about 8 (1971). 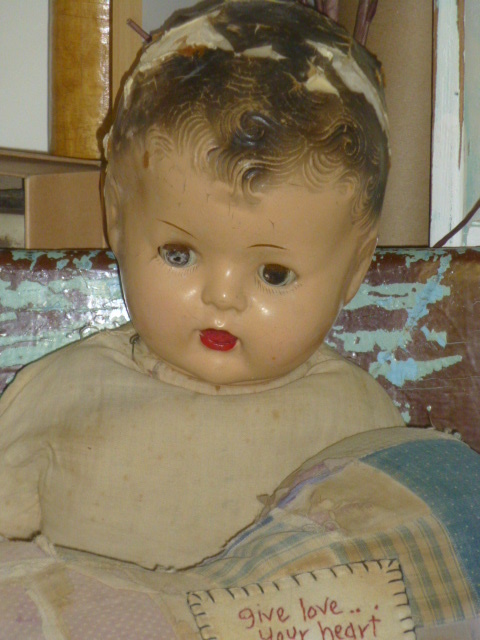 The doll looks like one I had in about 1950. It was dressed in boy clothes, red overalls and a red cap with a bill. She is a real “dolly”. Some darling little girl loved her so much you can see the love in how much she is used. I love her.